Zombies are the it creatures this year. If you’re going to be creepy–zombie is the way to go. 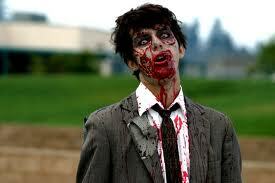 But sometimes you work with people who beHAVE like a zombie but you’re not quite sure if they’re actually infected. They tend to look dazed, unfocused and have a tendency to drool–but is that just the way they are? Or could they be an actual zombie? She stares at you with absolutely no expression. Just a little bit of moaning once in a while. You can hear his loud chewing even though you’re not even in the same room. And don’t get me started on how loud he can drink milk. He wears clothes that are stained with blood-colored spots he insists are ketchup or chocolate pudding, he doesn’t remember. It takes her forEVER to walk anywhere. If you’re behind her in a narrow corridor, trying to get to the drinking fountain, there’s a good chance you’ll die of thirst. He smells. Sometimes he smells like he doused his head in Old Spice. But he still smells. 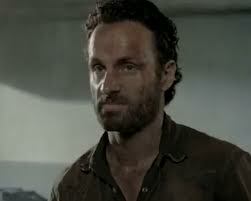 Your co-worker tells you he’s hunting a band of humans led by former sheriff Rick Grimes. Manners? What do you mean by this word “manners”? He picks his nose during meetings and rolls the booger between his fingers until he can flick it away. Usually in your direction. She continually thumps your head like it’s a ripe watermelon. You remember attending his funeral two years ago. She tells you she has a “hankerin’ for human flesh” and then laughs like it was a joke. But then she stops laughing and stares at your neck. Now, I realize that this behavior can describe many humans, including teenagers, but be careful because you never know when you’ll look up and stare into the eyes of the abyss. No, not your boss. A real-life, or real-dead, zombie. Carry a blunt object just in case–and aim for the head. Stay careful, my friends. You are a smart woman. And obviously NOT a zombie. A lot of these could apply to babies too. 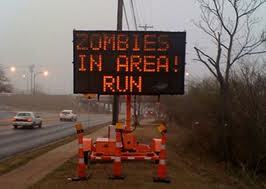 Really, we’re all screwed during the zombie apocalypse! I knew babies were out to kill us! They distract us with their sweet-smelling heads and then take over our minds. Sounds about right. Love this! !